Hey, guys! Mykel again filling in for Alex for this week’s Monday Night Raw! The Duke of Disses is back to pick apart, praise, and criticize this week’s episode of Raw. Let’s see what’s going on this week! Our first female sighting comes in the form of Natalya, The Bellas and Ronda Rousey talking but not talking as Ronda gets ready to face the leader of The Riott Squad, and jobber to the stars extraordinaire, Ruby Riott. Back from break, we are greeted with the sound of the Bella Twins theme song, their signature poses, I kind of wish Brie would change hers, and then here comes the champ, Ronda Rousey, and the three walk down the aisle together. The oddest teaming in a while, but whatevs. Following Ronda’a entrance, we have Ruby flanked by Sarah “Ride of the Valkyries” Logan and “How U Livin’” Liv Morgan. Only Ruby and Liv look different. Ruby has dyed her hair red and Liv is giving us Tonks realness with her now bubblegum pink hair. And in the words of AJ Lee when she ripped the Total Divas, the other one was there. During their entrance, we’re treated to a mini-video where the Squad waxes poetic. As we know, The Riott Squad will be facing The Bellas and Rousey this Saturday, and I’m guessing Liv is OK to compete? If she’s not, rumor has it Alicia Fox will be her replacement. Collar and elbow tie-up, followed with an arm drag/hip toss combination, that Rousey repeats twice. Ruby retreats to the arms of her comrades on the outside while Ronda is in the ring taunting her. Ruby with a knee to the stomach, and clubs her in the back, driving her to her knees. Waistlock by Ruby, counter into an arm drag by Ronda. Ruby tries to go to the outside, but Ronda isn’t having it, snatches her up and brings her back to the ring. Ruby makes it to her feet as Ronda rolls in and kicks her in the ribs. Ronda rolls out of the ring, with Ruby coming out and yanking Ronda into the ring post, then she shrieks like a banshee as she runs at Ronda and shoves her into the barricade. The champ is thrown back into the ring and covered for two. She continues by issuing some punishment to Rousey in the ropes and kicks her in the mid-section. Rousey tries to fight back, but is beat back down. Out of the ring she goes again, while Liv and Sarah lie in wait. Unfortunately, no attack can take place. Ruby makes her way very leisurely to the outside, meets Ronda and slams her face-first into the apron, and another two count Ruby gets. 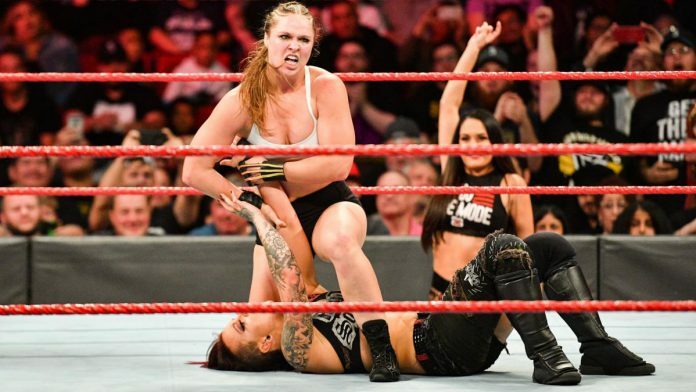 Ruby continues to wear Ronda down with submissions, until Ronda begins her punches, throws and Samoan Driver into the armbar for the win. Cue the hugs, send in the dancing lobsters. Next we have a “Moment of Bliss” which is used as a means to put over her match with Trish Stratus. It entails Bliss being a young girl and idolizing Trish, and upon meeting her, finding out she was rude, promising that there will be no Stratusfaction come Evolution. That was almost as bad as the one with Nia in Disney Land or World, wherever. Finally, we have our main event for the women in the coveted bathroom break/death slot in the form of Bayley vs. Alicia Fox, which I’m going to be honest, having turned RAW off by this point didn’t realize even happened until I peeped WWE’s Twitter. Out first is The Huggable One and Mr. Inclusion himself, Finn Bálor. This is in effort to promote their MMC challenge match this week on Facebook. Might I add Alicia looks GORGEOUS in that headdress. What’s not gorgeous is how she treated Sunil Singh and that Storm wig, I’ll reserve judgment on, but I noticed the back kept rising up like crust whenever her hair would go forward. I’ll say this for Victoria Crawford, she is committed to her character; in the ring, in her entrance, as well as in that mini video that was shown during her entrance. Match starts off aggressively which both women pushing and hammering each other in the corner. Bayley gets the upper hand and is pushed off out of the corner by Fox who when Bayley charges, hops onto the turnbuckle and stun guns Bayley on the top rope on her way down. Points for creativity. Fox follows with a running corkscrew facebuster, two count. Here comes Alicia’s patented chinlock, Bayley powers up, Alicia tries to transition into her Northern Lights Suplex, but Bayley clobbers her neck and back. Bayley finds herself seated in the corner, and Alicia Fox looks to alley-oop her out, only Bayley lands on her feet. Bayley clocks her like Shangela clocked MiMi ImFurst’s ripped fishnets and follows up with a second rope diving back elbow. Two count. Fox, undaunted gets to her feet first and flattens Bayley with a very high knee. Alicia follows now with the Northern Lights. Two count, another chinlock. Bayley fights up to be Irish and Scottish/Welsh whipped into the corner. Fox finds her zen, whips her again, charges and is flapjacked on the turnbuckle. Bayley crawls to put some distance between her and Alicia into the opposite corner. Alicia runs, more like casually jogs to Bayley and is met with two boots to the chest, two hard clotheslines and a middle rope stun gun. Alicia this time hides in the corner, Bayley comes after her while Alicia counters with a split-legged Briscoe Roll, only for Bayley to roll through and dropkick her in the mouth. Jinder tried to get involved but Finn takes him out of the equation, Fox tried to kick Bayley’s head off, and instead eats a Bayley to Belly for the L.
Thoughts: This episode gets the chop from me. It was pretty much The Shield Show with a dash of one retiree and three part-timers last their prime. Love you Undertaker, but it’s true. This was supposed to hype Super Showdown and it was a Super Letdown. What makes me so angry is I had to watch this show twice so I could recap it because I couldn’t remember what happened and that’s five hours approximately I can’t get back. Evolution is less than a month away, and this is how they hype a match? A casual throwaway segment that didn’t make use of Bliss’ mic skills properly, and Trish has yet to respond now, twice. Where’s Mickie James to promote her match with Lita? Where oh where is Dana Brooke? I did enjoy the Bayley/Fox match as it hasn’t been a singles match that has been beat to death on RAW, but damn. RAW has been utter trash for a while now, and on the way to this historic pay per view, these women deserve better. Alexa deserves more than a stupid “Bad Girls Club” looking confessional. Ember Moon and Nia Jax don’t deserve to HAVE NOTHING going on. If Sasha is injured, have her manage if she’s able to. Have the Bellas on commentary to put over their match and why they’re with Rousey, something, ANYTHING. Give Ronda a character, because this whole terminator bit is wearing thin quick, and I hope her matches aren’t going to continue this “badass” then suddenly “face in peril” then “three moves of doom”. Also, what was the point of having Natalya in the segment backstage then drop her like last year’s Versace for the match? The RAW brand is beyond trash, we need to call Iyanla to fix its life because it’s becoming too much, it’s flopped harder than Ashlee Simpson after SNL. Do better, RAW, or I will not be going to Evolution to watch your foolishness unfold live. You have women with talent use them to their potential. The highlight of the evening shouldn’t be suddenly seeing Shawn Michaels bald. What are your thoughts on this week’s Raw? Who are you rooting for at Super Show-Down? Are you still excited about WWE Evolution? Sound off in the comments!